Staff photo by Damien Fisher Christopher A. Dallas-Koziol, in court on Friday, is on trial for allegedly being part of the kidnapping and beating of a man suspected of supplying drugs in a fatal overdose. 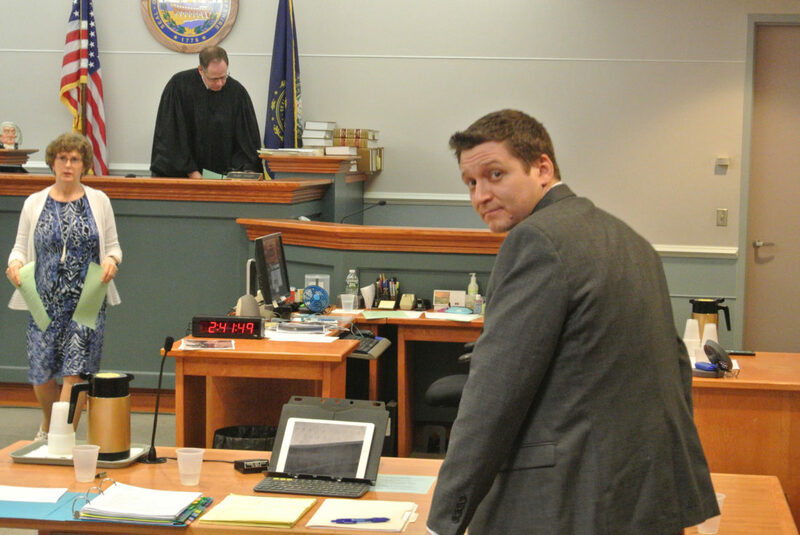 NASHUA – The jury of eight men and four women in the Christopher A. Dallas-Koziol kidnapping case rested Friday after defense attorney Rusty Chadwick tried convince them prosecutors did not show enough evidence to convict his client. “There’s not a penny’s worth of evidence in this case,” Chadwick said. Dallas-Koziol, 32, is charged with one count each of first-degree assault, second-degree assault, criminal threatening, kidnapping and criminal restraint. His alleged co-conspirators in the incident, Jeremiah Starkweather, 43, Jonathan Emery, 39, and Shane McKenzie, 39, are serving prison sentences for their roles in the matter after entering into plea agreements. The four allegedly kidnapped Michael Thomas and beat him after they believed Thomas provided the drugs that their friend, Eric Luna, took when he died from an overdose in October. Thomas did not testify, and has reportedly not been seen in some time. Chadwick attacked the state’s case, saying Assistant County Attorney Cassie Devine did not produce enough evidence that Dallas-Koziol actually took part in the beating of Thomas, starting with the fact the only witness was McKenzie, someone with a criminal record. “He’s certainly no angel,” Chadwick said. Devine said it was Dallas-Koziol who brought a gun to the Cross Street apartment in the French Hill section of the city where Thomas was being held, as well as the knife used to cut Thomas’s face. “They poured lighter fluid on his clothes, stripped him naked and put him in the tub, and then Mr. Dallas-Koziol sliced open his face,” Devine said. The ordeal went on for several hours before Thomas was able to grab a knife and stab his way out of the apartment, according to court records. Devine said Thomas told police and EMTs a consistent story about what happened, and the physical evidence inside the apartment supported that story. “They tried to kill me. They think I killed their friend,” Thomas reportedly told police. The jury began deliberations on Friday, but broke for the weekend. Jurors are expected to return to the Hillsborough Superior Court-South in Nashua to resume work on Monday.